As hard as the US has worked to destroy the taco, they have worked equally hard to mess up pasta. Pasta is an art. It is magic. It is a canvas on which you can create a masterpiece. You know what pasta does not need? It does not need to be drowned in so much sauce that you can’t even taste the noodles. And that, my friends, is what this country wants to do to pasta. Pasta doesn’t need all that. Pasta wants to be mixed with flavorful, high quality ingredients and allowed to shine for itself. This pasta combines spicy garlic, sweet Montamore, and nutty parmesan, along with earthy mushrooms and fresh asparagus for an intoxicating blend of flavors that hits every part of your pallet. If you are not familiar with Montamore cheese, it is a fruity, creamy, buttery cheese that was inspired by the flavors of parmesan. It melts nicely in with the pasta. 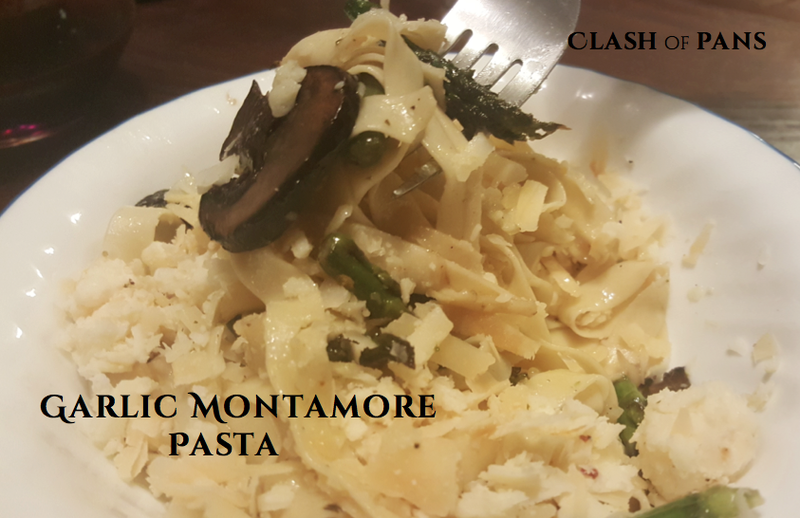 I mixed parmigiano reggiano 50-50 with the Montamore to keep the nuttiness that true parmesan has while still picking up the flavors of the Montamore to complement them. If you have never tried this cheese, put it on your bucket list. It is worth every bite. 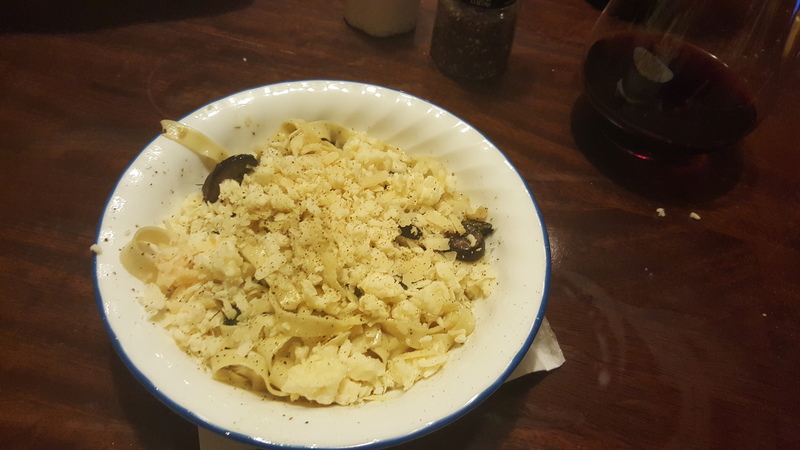 I also used quite a bit of garlic in this dish, because my Italian fiance adores it. If you are not a garlic lover feel free to lower the garlic level, but I promise, it isn’t as strong as you might think. The secret is to put it in olive oil, bring it to a simmer, then turn the heat off and let sit for at least 15 minutes. The hot oil cooks the garlic without frying it, and the garlic in turn infuses the olive oil with all its beautiful flavor, allowing ever bit of pasta to be evenly touched with garlicky goodness. This is pasta the way it was meant to be. Start by prepping the pasta dough. In a stand mixer, mix together all the pasta ingredients with the flat mixer for thirty seconds. Then, attach the dough hook and continue to mix for about 2 minutes, or until forms a dough. You want a dough that is leathery, not crumbly or sticky, and holds together firmly. You may need to add slightly more flour or water as necessary to reach the right consistency. Punch together by hand for about 2 more minutes, then let rest at room temperature for twenty minutes while you prep the rest of the ingredients. Melt butter in a large cast iron pan over medium heat, then add the chopped asparagus. Let cook about 10 minutes before adding the mushrooms. Sprinkle generously with fresh cracked black pepper and sea salt and let cook, stirring occasionally. In a small nonstick pan pour the olive oil and garlic. Cook on medium heat until the oil starts to simmer. Turn off the heat but leave the pan on the burner. Let rest while you finish preparing the rest of the meal. Bring a large pot of water to a boil with a generous pour of olive oil and salt. When the pasta is cooked, add it to the cast iron pan. Take the pan off the heat and toss all the ingredients together, along with the garlic infused olive oil and about 1/2-1 cup of the pasta water. 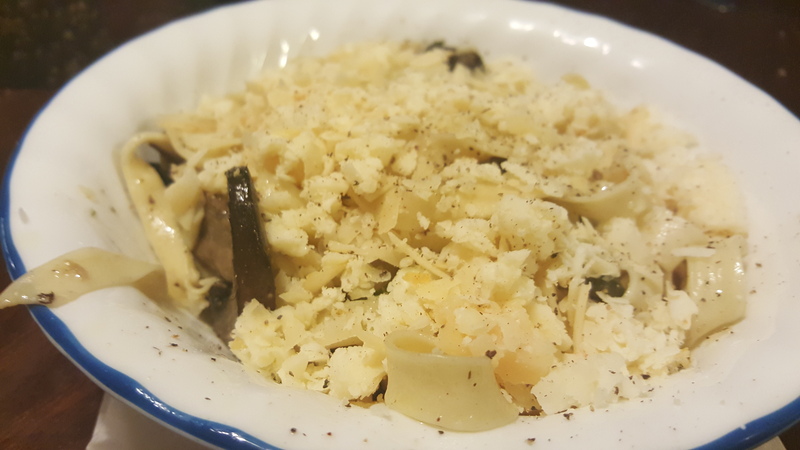 To serve, put a generous helping in a bowl and top with desired amount of shredded cheese. Can finish with a generous hit of black pepper, or a sprinkle of red pepper flakes, if desired. I recommend a big glass of good red wine to drink with this luxurious dish!